I decided to buy plants this weekend and get them in pots. The last frost free date is, technically, tomorrow, but there's slim chance we're going to have frost again until October. Time to hit the nursery. Normally, when I want to buy quality plants, I head west to Planter's Palette. An area staple for upwards of 20 years, they have acres of plants which give you more ideas than sense sometimes; not that I'm speaking from experience, mind you. That was the plan. I got myself up early, showered, had breakfast and went outside to start pulling pots out of the shed. 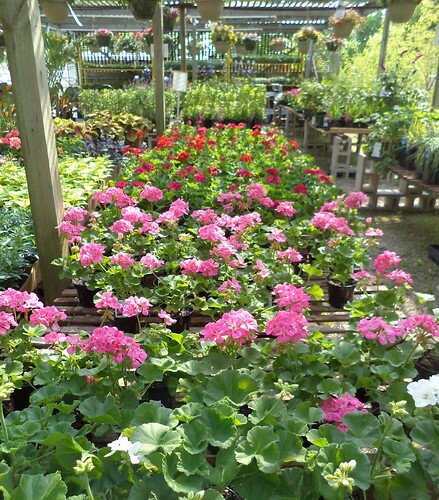 The overwintered geraniums were slated to be repotted. 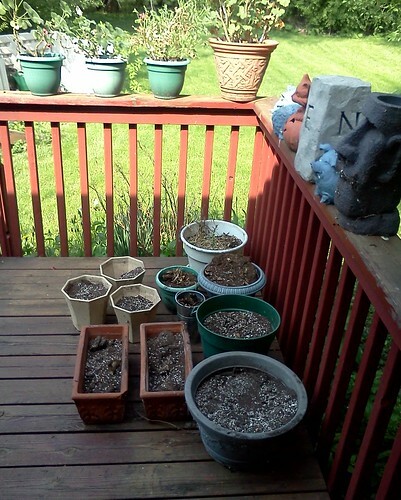 My spindly little peppers and sunflower plants could come outside now. 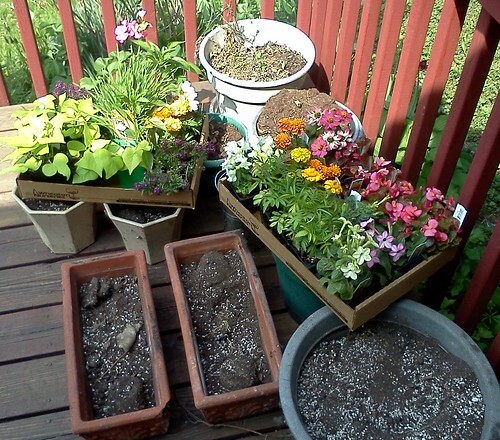 I think I might even put plants on the front steps, something I haven't done in years. This looks about right. Fill these and I'll be good. With it slated to be a glorious weekend, I knew there would be dozens, scores, maybe even hundreds of people browsing the too narrow aisles and taking the too few carts. Carole's friend, Phillip, worked at PP for years, starting at age 16 and continuing through college. I've spent a lot of money there. 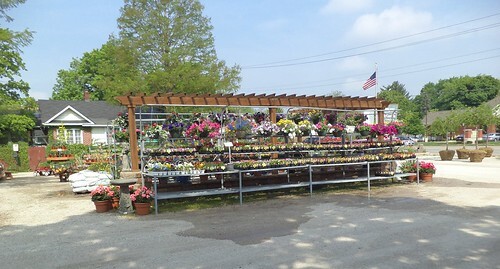 As I headed west, I drove right by Wheaton Nursery and Garden Center. They have, at best, a fifth of the area PP has. I've driven by them for all of the 31 years I've lived in Wheaton, but never stopped. I thought of the battle to find a parking place at PP, the quest to find a cart for the few things I wanted to buy and the wait time for checking out and I decided it was time to stop at Wheaton Nursery. I was their first customer of the day and I got the most personal service I think I've had in years. I pulled out my list and the gal watering flowers pointed to places where I'd find things. She got me a red wagon and a couple of cardboard containers for the plants I was buying. Yes, I went with a list. I could go nuts at a nursery and I really didn't want to come home with three times more plants than I had room for or ambition to plant. I wanted another geranium. I have white, red, light pink and salmon. What would go good with those colors? Sometimes choice is NOT a good thing. I wanted to get more peppers to make sure I get something this year. They didn't have the orange peppers that I really want since I only got one plant to sprout. I did find a couple to bring home. 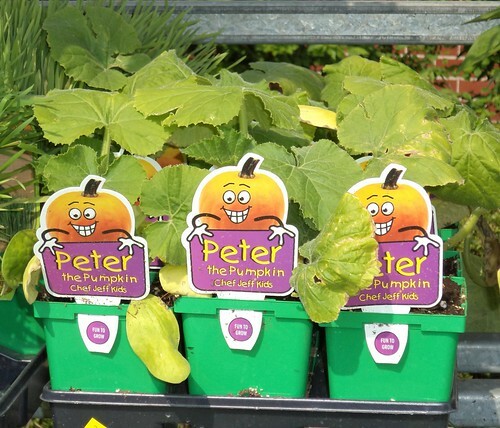 They have plants to encourage kids to garden. I was sorely tempted to buy a couple pots of corn. I might still do that. I'm not sure how corn would do in a deck pot, but it's tempting. These pumpkin vines were also tempting. I could make a trellis off one corner of the deck and grow the pumpkin that way. Reality smacked me upside the head and wondered exactly where I thought I'd put this. The pumpkins stayed at the nursery. Here's what came home with me. Not bad. I did a fairly good job of resisting the siren song of a lot of different flowers. There's a nice variety this year with a wide spectrum of colors. That's all I want, really, variety. I still may go back for corn. I Won't Be Saying, "Thank You." Can We Go Out and Play? And All I Got Was This Tee Shirt. Reading is Fundamental. A Lot of Books are Not.